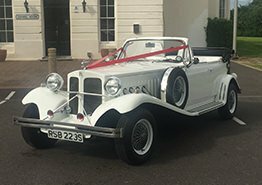 As wedding car hire specialists, A.T. Beauford provide classic and vintage wedding car hire in Essex for people looking to get married in Essex the surrounding Essex areas. Within the fleet of motors that we offer, you will find a range of elegant cars, perfect for making your wedding day a day to remember. So, should you be interested in any of the wedding cars we have available for hire, we encourage you to get in touch so we can talk to you more about the process and how hiring a wedding car from us works. 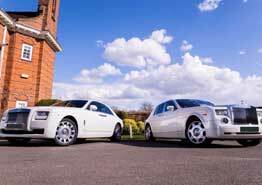 Working closely together we can ensure all your needs are fully catered for with our wedding car hire service in Essex. With a careful selection of sophisticated wedding cars available to hire for your special day, A.T. Beauford can help you moving forward. Whether you are looking for a car to suit you and your partner, or you would like a more roomy motor for the bridesmaids, groomsmen or close family, we offer a range of classy motors to cater to your needs. We are always on hand to answer any questions you have relating to the cars we have available for hire, which can be viewed below. If you are leaning towards choosing one of the cars that we offer for your special day, please take the time to call us so we can answer any questions you have. We can check the availability, talk to you about pricing and make a booking for you if you would like to do this straight away. All of the cars can be viewed prior to your special day, so if you would like to come down and view one, you can do so at a time that suits you. 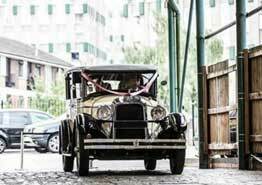 From modern wedding cars through to vintage wedding cars, we have your needs catered for. 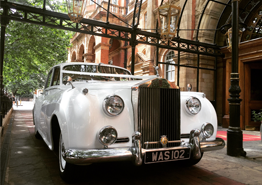 Hiring a classic wedding car in Essex shouldn’t be difficult. A.T. Beauford have done everything we can to make the process simple. 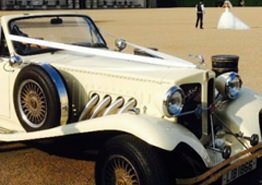 The elegant motors that we provide for hire in Essex are a great way of adding a touch of class to your special day, turning the heads of all who are close to you and have come to see you tie the knot. 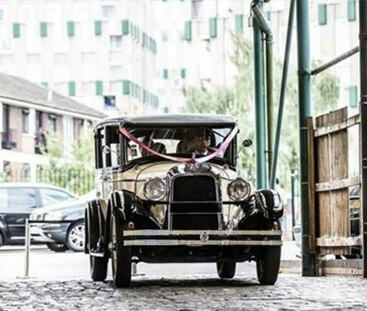 For many years, A.T. Beauford has been at the forefront of many happy couples wedding days. With that being said, we truly understand the high standards customers come to expect from us. 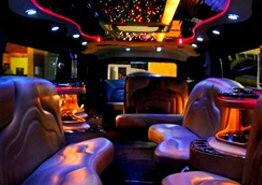 Whether you are interested in a Hummer Limousine or a White Beauford for your Wedding Day in Essex, A.T. Beauford are here to make sure your day is as good as it can possibly be. Essex is a large county, with hundreds of villages, towns and cities within. 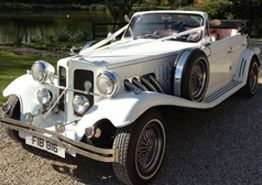 A.T Beauford are pleased to offer our wedding cars to the bridges and grooms of Essex looking to tie the not. As part of our car hire services in Essex, we offer wedding car hire in Chelmsford, Romford, Colchester, Braintree, Basildon, Harlow, Dunmow and more. So if you are looking for vintage or classic wedding car hire in the county of Essex, we will gladly assist you. If you are still yet to decide on the wedding venue, check out some of the top wedding venues in Essex here: www.hitched.co.uk/wedding-venues/essex. 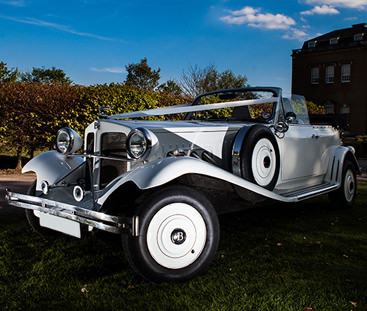 If you are in the market for wedding car hire in Essex, calling A.T. Beauford is a clever move. Because of the service we are offering, we allow you to travel comfortably and stylishly to your wedding day using one of the cars we have within in our range. After many years working in a competitive industry, we know exactly what it takes to deliver a stellar service to all who would like to hire a car from us. 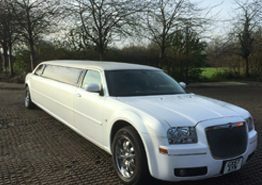 Not only do we provide the motor, we also provide a chauffeur driven service to ensure you travel safely to and from your wedding venue in Essex on the day. Our modern Wedding Car Hire service covers Romford, Basildon, Chelmsford, Braintree, Colchester and the other areas within and around the Essex county.